It was a fun filled afternoon here today! I was up early as I knew I needed to get eggs cooked and cooled for around lunchtime my special guest was on his way over. My grandson came over to spend the afternoon and it was a perfect day to get busy and color our Easter eggs. We used a dye set I bought at the store to color the eggs. I was thinking about going with a more natural approach , maybe next year. My grandson loves coloring eggs, we have done this every year since he was born. He stirs the color tablets in the water, vinegar solution and gently places the eggs in each cup and then waits for the color to get to the shade he wants. Some are darker, some are light in hue. My grandson really got quite creative this year, and he made leprechauns hats with pots of gold. He made chicks, and a bouquet of flowers. He made jack o’ lanterns, not Easter related but looked really great on the orange colored eggs. Lines were carefully drawn around an egg, and just like that it was a carrot. 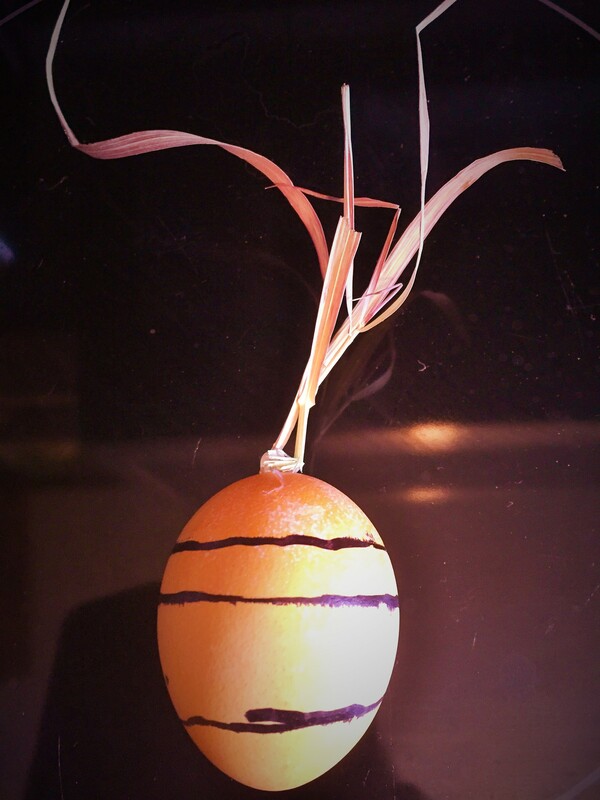 I used a glue gun to glue a piece of dried grass on the top of the egg for the carrot top. I was very impressed with his creative imagination! I had torn out a page of the March issue of Canadian Living Magazine and it has been hanging on my refrigerator for days, as the cutest Easter eggs by Sarah Gunn were in an article on page 83 and resemble strawberries . I bought some green burlap from our local Dollarama, and this I had cut out for the leaves for on the strawberries. Alison and a very a special friend of hers stopped in for coffee. Thanks for your help Alison coloring those strawberry seeds. 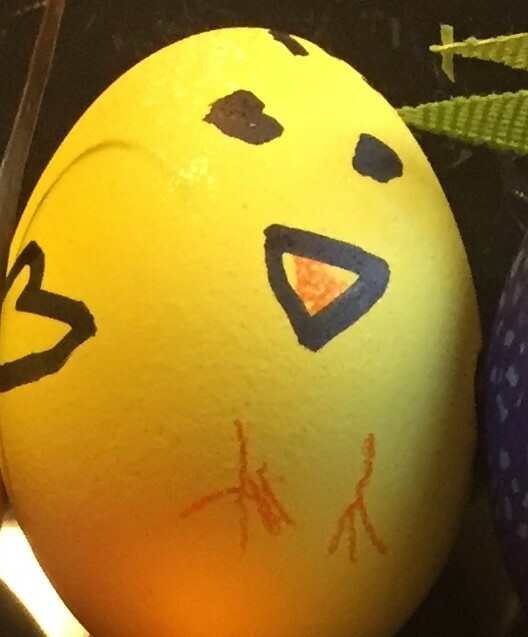 Her friend enjoyed her hand at adding fine detail to a couple eggs also. She proved herself to be very artistic and I would definitely say some patience was involved too. She designed a black raspberry and her own unique design on another egg. Well the eggs are resting in the refrigerator waiting for the Easter Bunny to hide them. Then the egg hunt will be on! Wishing everyone a Happy Easter! Your grandson did a fabulous job…creative indeed! The carrot one is such a cool idea!! It is a ton of fun decorating Easter Eggs. It was a lot of fun and creativity was definitely a huge part of it! We did not know he had his thoughts on a carrot, but it sure turned out cute. I decorated them with my kids when they were growing up and now with my grandson, so fun for sure! Your grandson is going to be very artistic just like his grandmother!! 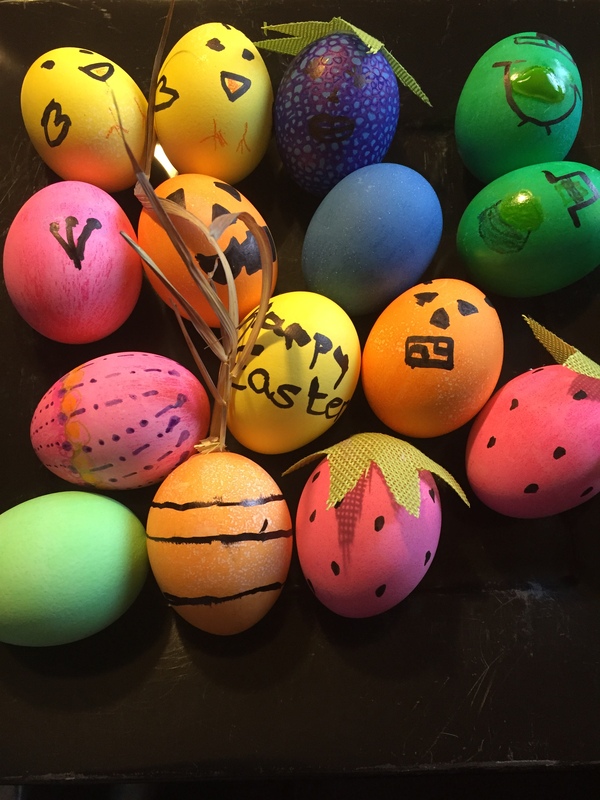 I always enjoyed colouring eggs with my girls when they were young, now I can do it with my grandkids! !